Tankless electric water heaters are designed to instantly heat water as it circulates through a copper heat exchanger equipped with water flow sensors. The heater is normally turned off and it is activated only when water flow is detected. Tankless water heaters may be installed throughout the home at more than one point-of-use, far from a central water heater. Or, larger centralized models may be used to provide all the hot water requirements for an entire house. - They provide a plentiful continuous flow of hot water when compared to a limited flow of continuously heated hot water from conventional tank water. - They save energy since the heater is only activated when water travels through it. The main disadvantage of these systems are their higher initial costs for the equipment and installation. Instant, consistent and endless hot water. Savings of up to 50% on water heating costs. The most advanced, self-modulating technology available, meaning these heaters will adjust how much energy needs to be input based on how much hot water is needed. Stylish and advanced design that is pleasing to the eye. Digital display with temperature control in ​increments of 1°F ranging from 80°F to 140°F​. Copper and stainless components designed for efficiency, durability and easy replacement. ecoSMART ECO 36 is the 36-kW and most powerful tankless water heater made by the company, with the capacity to handle a large single-family home with the need to run hot water simultaneously from multiple applications, even in colder climates. In warmer climates, the ECO 36 heater can run up to four showers and two sinks simultaneously without running out of hot water. ​ECO 36 measures 17 x 21 x 3.75​ (inches) and weighs 18.35 lbs. ecoSMART ECO 27​ is the 27-kW and one of the most powerful tankless water heaters made by the company, with the capacity to handle a large single-family home, and has the capacity to deliver endless hot water for multiple fixtures, even in colder climates. In warmer climates, the ECO 27 heater can run four showers and one sink simultaneously without running out of hot water. ​ECO 27 measures 17 x 17 x 3.75​ (inches) and weighs 14.7 lbs. ecoSMART ECO 24 is the 24-kW tankless heater designed for a medium to large single-family home. In cold climates, this model can heat a shower and two sinks simultaneously, and in warm climates, three showers and two sinks. ​ECO 24 measures 17 x 17 x 3.75​ (inches) and weighs 14.3 lbs. ecoSMART ECO 18 is the 18-kW tankless heater ideal for a large apartment/townhome with up to 3 people. The ECO 18 is the mid-range model that can heat over 2.5 gallons per minute. So, it can handle a shower and a sink in cool climates. In warmer climates, it can handle two showers and two sinks. ​ECO 18 measures 17 x 14 x 3.75​ (inches) and weighs 11.7 lbs. ecoSMART ECO 11 is the 11.8-kW tankless heater that can be used for multiple or single applications depending on your climate. ECO 11 can provide hot water for one shower in colder climates, or two showers in warmer climates. ​ECO 8 measures 11.5 x 8 x 3.75 (inches) and weighs 6.7 lbs. ecoSMART ECO 8 is the 8-kW electric tankless water heater ideal for providing hot water for point-of-use or low-flow applications. In warm climates the ECO 8 can provide hot water for one shower and a sink simultaneously. ​ECO 8 measures 11.5 x 8 x 3.75 (inches) and weighs 5.3 lbs. As mentioned above, each of these heaters is equipped with a patented, self-modulating technology, so that it will only consume the energy necessary for the current demand. Note that the water flow rate that can be obtained with each of these heaters depends on the incoming water temperature. Below is a chart showing the flow rate capacity of each model, measured in gallons per minute (GPM), for various inlet water temperatures (from 37°F to 77°F), and calculated for a set output temperature of 105°F. ​For example, if you have 2 sink-faucets and a single shower, you will need a total water flow rate of (2x 0.5) + (1.5) = 2.5 GPM. If the weather where you live is such that the inlet water temperature is about 42°F during the winter, and you want the output water temperature to be always at 105°F, you will need to select either ECO 24, ECO 27 or ECO 36. All three models will provide you with the required flow rate during all year. Clearly, based on the above chart, the other 3 models will not provide during the winter the required 2.5GPM flow rate. ​Note: The temperatures shown below are for USA regions only. 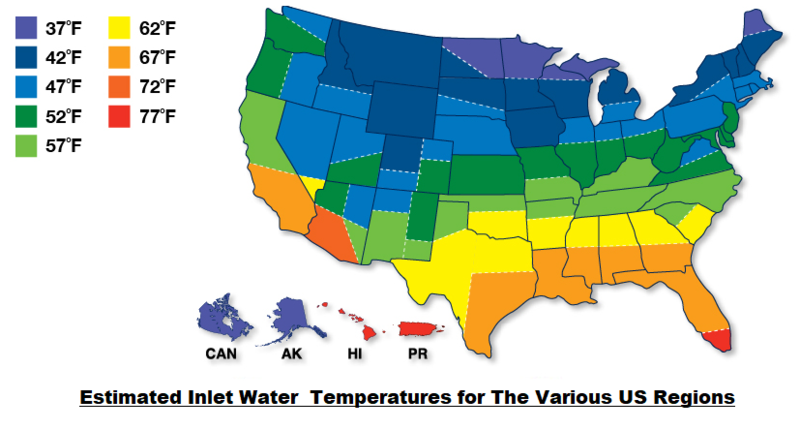 If you live outside the USA, you should first determine the average low temperature of where you live, and then use the above chart to select the heater model that will respond best to your home's needs. All ecoSMART ECO heater models come with Limited Lifetime Warranty.